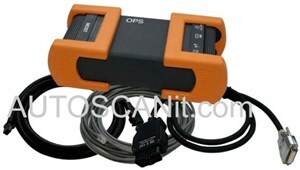 Original German made BMW OPS scanner set (Retail Price: $3,000). THIS UNIT IS THE LATEST MODEL 2014 GUARANTEED TO BE BRAND NEW DIRECT FROM THE MANUFACTURER, (WE OFFER YOU THE BEST PRICE ON LINE ON THIS ITEM) WE ALSO PROVIDE FUTURE SOFTWARE UPDATES. Vehicle models from the E65 on,it is the first time for BMW to use fibre-optic cables as the standard for communication between control units. OPPS has been designed for encoding, individualising and programming ( CIP) via the Software Service Station (SSS) and envisaged for use as part of the BMW diagnosis Information system (DIS) from DISPlus and Group Test One (GT1). It is intended for testing and programming tasks from the E65 series, taking the place of the diagnostic head. OPS is intended for rapid programming of control units. DIS V57 is the main software for all BMW and MINI series diagnosis.It makes a complete Diagnosis.If it finds error codes you can erase them or continue with each error code to see what produces it and how to fix the problem . Inside DIS you will find TIS too. As usual DIS and Progman are for IBM T30 laptops but With this Software that is already installed you don't have to buy an old and slow IBM T30 laptop, you can copy software CD's provided to any new laptop or PC( Instrucions CD included). It needs 60 GB on the Hard Drive.